Next tour during the 2018 Manchester Literature Festival fringe. Date: Sat 13 Oct 2018. Booking: Just turn up please! 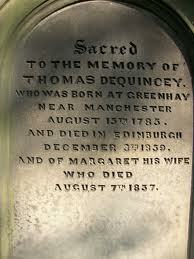 Born in a hotel on Manchester’s Cross Street in 1785, Thomas De Quincey is perhaps the greatest local-born writer in Manchester history. Well, him and Anthony Burgess. Originally he was plain Thomas Quincey (he added the “De” to make himself sound more glam), raised by a wealthy family who lived in glorious countryside near Moss Side (really), he ended up on the streets of London’s West End as a penniless drug addict. The experiences inspired his most famous work, Confessions of An English Opium Eater, a memoir partly of his boyhood in Manchester but one laced with drug-fuelled hallucinations and passages of the most mesmerising prose. In Manchester he ran away from the Grammar School, visited the Portico Library (which he mentions in Confessions) and mourned at family graves at St Ann’s Church. Retrace De Quincey’s wayward steps with Ed Glinert, Penguin author and editor of Penguin Classics’ Sherlock Holmes stories.